Over the years, climate change has affected global food production. Now, a Filipino scientist spoke out on how we can adapt to the changing environment by growing different varieties of rice that can survive any types of extreme weather conditions. For more than half of humanity, rice is life. However, rice and other crops are under grave threat of climate change. Climate change has devastating impact to melting glaciers, rising sea levels, monster storms and intense heat waves. In recent years, the International Rice Research Institute (IRRI) has developed varieties that can survive floods, salt intrusion, cold or extreme heat and drought. Doctor Glenn Gregorio, a senior scientist at Los Baños headquarters has been cross-breeding these climate-smart rice. The Filipino scientist says farmers should not fear when El Niño sets in. A common rice needs enough water to fill in. It really needs plenty of water. But the one he developed, during drought season like El Niño it will still continue to propagate. In Tagalog they have drought-tolerant rice varieties. The samples are NSIC Rc192 (Sahod Ulan) and PSB Rc23 (Katihan) that at that kind of stress. Sahod Ulan is able to generate a yield of up to 6.7 tons per hectare depending on the variety. There's also a variety that can thrive underwater for 10 to 15 days. Something Filipino farmers can switch to, given that we suffer from devastating typhoons and floods. This type of rice has the ability to stand still, it will not grow fast, it will just stay underwater and wait for the water to come down. The plants know that after 2 weeks there would no floods, then resurrected and continue to grow. First, second and third cropping, compared to the three-time yield of traditional varieties under normal conditions. Tubigan could produce as much as 10 tons per hectare. There are also 15 varieties that can withstand saltwater. About 10 million farmers in South Asia and Africa are successfully cultivated in these climate-smart rice. Ironically, very few Filipino farmers use the technology despite the fact that Philippines has big and long coastlines plus a lot of Islands. So, most of these coastal areas are affected by salt. 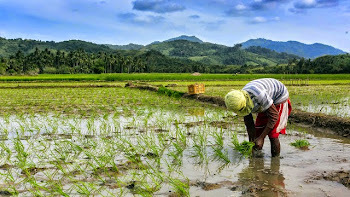 Most of the farmers are abandoning the area thinking they could not cultivate rice and they are not aware that here in the Philippines we have salt-tolerance rice varieties that can be planted on those conditions. Many do not know that seeds are available in IRRI, PhilRice, Agriculture Department and local government units. Another challenging task is convincing them that it's real, it's not a joke or fictional. Some scientists have already deal with demonstration and planted these varieties together with Filipino farmers. There's more varieties to come, the next generation for the rice. Scientists are crossbreeding climates-smart rice to high-yielding one. Food security will not be a pipe dream if farmers will be able to embrace this new technology. Thank you for reading No More Food Shortage! Here are the New Generation of Rice to Fight Climate Change posted on the website Kwentology if you want to redistribute this article please include the link as the source. Have some kuwento to share? Contact us!